King Crimson ex-frontman comes back to Tel Aviv for a Power Trio show on February 3rd, 2016. He was kind enough to answer a few questions for his third visit to the Holy Land. 1) First – thanks for coming to Israel again. It should be your 3rd time here. How was the last concert with the Crimson Projeckt in Tel Aviv? Adrian Belew: it was amazing. I’m a lucky person to get to travel to so many important places. crimson project is a mighty sounding band I really enjoy working with. it is, among other things, my vehicle to play 33 years worth of king crimson music I helped create. and I love coming to Tel Aviv. this time I’m bringing something I love even more: the power trio. not to be missed! recently we have taken a new approach to playing music live and it’s something no else is doing yet. 2) “Spotify” seems to be a new digital “enemy” of yours. Judging from your FB posts, you are very worried about the future of professional musicians. Adrian Belew: I have no enemies and nothing against spotify per se. I was only dispensing information which I think music lovers should be aware of. I personally make nothing from spotify and it doesn’t matter, that’s not how I thrive. my concern is for the future of those musicians (young and old) still vying for a way to make music their livelihood. I think society is in danger of losing its best “intellectual property creators”of all type by allowing royalty incomes to be the lowest possible rate. 3) “66 is the new 26” – you’’re recently declared. You’re a very busy artist, performing worldwide, devloping apps and releasing new music. Can you say you’re working harder now than you’ve worked when you were 26 years old? Adrian Belew: your age has everything to do with your perception of yourself. most of the time I don’t even feel 20! and it’s a good thing, because I work harder now than ever before. when I was 26 years old I was a skinny starving musician who spent most of his time trying to figure out how to make the rent! with success comes the hard work and I wouldn’t have it any other way. I’ve been given a platform of self-expression any artist would cherish and I love what I do. 4) Your song “This Is What I Believe” from 1992’s “Innver Revolution” album has caught my attention. You wrote: “All the world is dangerous, Full of homicidals and terrorists, But underneath their blanket of hate, The only thing that will survive is our love and faith”. Do you still believe in this today? Adrian Belew: more than ever. love drives all good things and without faith I would never even board a plane in these dangerous times. but you can’t hide in a corner, you have to live your life. I’m not a politically-minded person, I’m more of a humanist. I often wonder when people will realize we are all the same: human beings. mankind. regardless of our cultures, religions, and skin tones. and we should treat us other accordingly. 5) The great Frank Zappa keeps appearing in your publications, memories and annoucements. You’re very proud of his endorsement “Adrian Belew re-invenvted the guitar”. Since his death, can you name a new musical genius in the world? is there anyone in his level? was Zappa a once-in-a-lifetime phenomenon? Adrian Belew: there will never be another frank zappa, he was utterly unique. I am fortunate to have worked up close with him and I owe him a great deal for helping me. I can’t name new musical geniuses because I don’t listen to other people’s music anymore. I learned years ago to stay focused on the music I hear in my head and for me that means shutting out everything else. I know that sounds awful and I’m sorry, but it is the best way for me. 6) One of your great songs “Asleep” says, simply: “one day you wake up. But you didn’t even know you were alseep”. It was written after 9/11. Did that dramatic event *really* wake us up, in hindsight? I mean – maybe we all just woke up for a few minutes and then fell asleep again? Adrian Belew: “this is a dangerous place”. I wrote that line in 1981. so I have been awake for a while. “asleep”was indeed written regarding 9/11. it doesn’t seem to have”woken all of us up”enough, but I think it is more profound for some of us than others. it did manage to change life forever, especially here in america where we can never go back to the way we were. 7) You’ve travelled all over the world and performed in so many cities. Can you nail down the #1 gig of your life so far? I know it’s really hard to do, but would you please be so kind as to pinpoint one particular music event that you always look back to as the “singular moment” of a long career? Adrian Belew: there are so many many moments I could name, but you are most impressionable when you’re young. when I was only 28 years old I remember standing on the stage of madison square gardens in new york city right next to david bowie playing to a sold out audience of thousands! the front rows were filled with famous people of all sorts including andy warhol, dustin hoffman, mick jagger, and interestingly enough: talking heads. that was quite a moment. 8) The Music Industry has changed: Once it was the gig promoting the album. Now it’s the album promoting the gig. Do you find yourself performing much more than ever before, or it’s business as usual? Adrian Belew: I do perform now more than ever, especially internationally, but it’s because I love it (in small doses). live performance is now the primary source of income for most musicians whether they love it or not. it’s the one thing the bad guys haven’t yet figured out how to steal from us! there were years in my life when I dreaded touring, but at some point it turned around 180 degrees. now I enjoy touring. (in small doses). there is something entirely zen about performing live. a performance happens once and it seems like in an instant it’s over! 9) You always talked about the compromise a musician like yourself has to make within a band format, with all the frustration that goes with it. You prefer to create alone, just like a painter with his canvas. Having said that – isn’t it amazing what King Crimson (for example) has achieved with this huge compromise — in retrospect, of course? Adrian Belew: I complain too much and too loud about many things. it’s part of my nature to point out the negatives before moving on to the positives. but once I’ve done so I can really enjoy the positives! clearly my life is a balancing act: family time, career time. touring, recording. writing, performing. digital, analog. collaboration, solo work. I need a diet of all these things and being in a band is very important to me. king crimson is and will always be one of the most important collaborations of my career and nothing can change that. for me it was mostly fantastic. 10) I’ve read your post about your first concert ever – The Beatles at Crosley Field in Cincinnati back in 1966. You say Paul McCartney is your favorite artist of all time. You’ve met both Paul and Ringo. Sometimes you sound like Lennon himself. Are you still creating music today that is directly inspired by the Beatles? Adrian Belew: yes. that cannot change either because it’s in my musical DNA. I learned enough from the beatles (at a young impressionable age) to set me on creative fire for life. 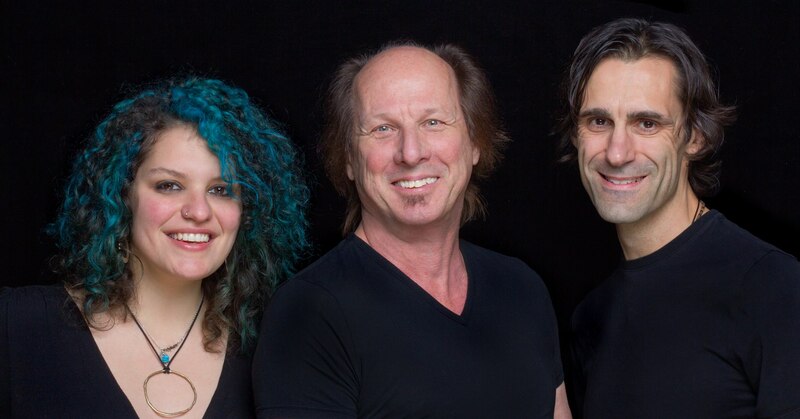 The Adrian Belew Power Trio will perform live in Tel Aviv’s Barby Club, on February 3rd 2016. Julie Slick (Bass) and Tobias Ralph (Drums) will help Adrian Belew (Guitars, Vocals) make this a great evening. This entry was posted in american prog rock and tagged adrian belew, king crimson. Bookmark the permalink.